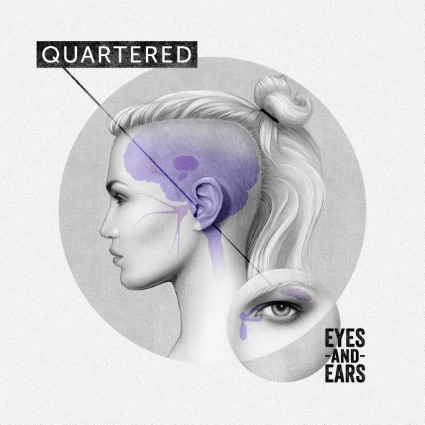 CD Review: Quartered - "Eyes And Ears"
If Quartered proves nothing else, it’s that there are some pretty talented heavy bands north of the border. Eyes And Ears, the third release from the Vancouver, British Columbia quartet, combines the progressive alt-metal stylings of the Deftones with the brooding atmospherics of “Capricorn”-era 30 Seconds to Mars to create a mixture of caustic riffs, biting vocals and spiraling, emotional melodies (“Blink Blink Flash,” “Call Me Crazy,” “Violent Love”) and moody, melancholic landscapes (“Speak Of The Devil,” “Echoes,” “She Sees Colour”). Closer “Ricochet” is a superb encapsulation of Eyes And Ears, complete with churning guitars, soaring hooks and tailor made bouts of call-and-response. Eyes And Ears is impressive in its own right, making it one of the better records you’re not listening to right now. Well, as they say, there’s no time like the present.